“Child, eat your vegetables and stop playing with them!” – Heard and ignored a thousand times, but finally you can and want to play with broccoli. But only if you wear the matching broccoli sweater! Among other awesome motifs, the broccoli sweater will definitely make a good impression on you. Because everyone knows that vegetables are good for you! For the next festival or the respective event of your choice you will be dressed appropriately. The sweater is available in sizes S to XXXL. But pay attention to the exact sizes, because these are Asian standards. If in doubt, always order one to two sizes larger. By now (finally?) 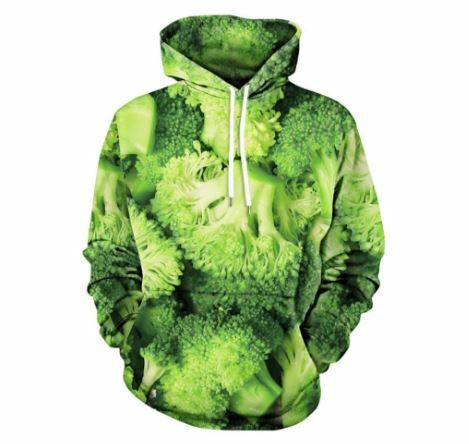 the broccoli hoodie has also been designed. This is about twice as expensive as the sweater, but also looks a bit more stylish. If you prefer to wear a hood and like to attract attention, you should take a closer look at the hoodie.